Smart luggage is becoming more and more popular. This is no surprise when you consider the fact that we run our whole lives through our smartphones these days. There is nothing worse than being in a foreign country trying to get to your destination only to find that you need to check Google maps and you can’t because your phone doesn’t have enough battery. Fortunately, there is a solution that you can use in the form of smart luggage. This type of luggage allows you to charge your electronic devices through your luggage when you are on the move. Obviously, there are a lot of benefits that come with doing this. 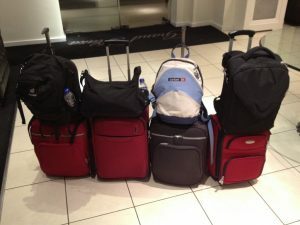 In order to choose the best type of luggage that offers this function, there are a few things that you will need to do. One of the best things that you can do is to take a look at plenty of smart luggage reviews. In order to save you some time, we have tested and reviewed some of the most popular options on the market right now and provided reviews for our top three. See below for more information. 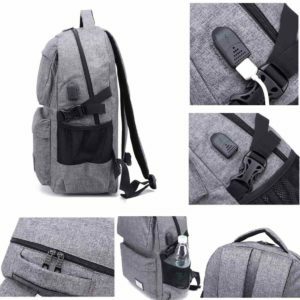 We hadn’t actually heard of this brand, so we weren’t really sure what we should expect from this smart backpack. However, after testing it we were really impressed with the results. Read on for our review below. Adjustable straps make it comfortable to wear. The capacity isn’t ideal if you have a lot of hand luggage. The first thing that we really liked about this smart luggage backpack is how stylish it looks. 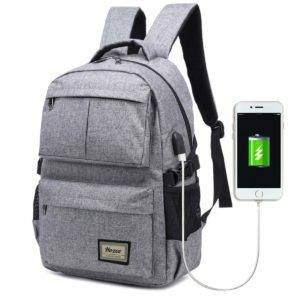 You wouldn’t even know that it was a USB backpack; it just looks like a standard fashion backpack that you would take with you on a day trip. The capacity of the backpack is fine if you are just planning on taking a few items with you in your hand luggage. However, if you have a fair few items to take with you then you might find that the capacity is a little on the small side. Another thing that we really liked about this backpack is that it is waterproof. We tested it in wet weather and had absolutely no issues with keeping water out. In terms of the effectiveness of the charger, we found that it charged a standard smartphone really well and we had no issues at all. It has adjustable straps which make wearing it really comfortable; perfect for a day trip. Overall, this is a really good budget range product that actually performs a lot better than you would expect given the price tag. 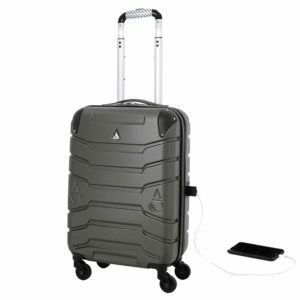 Aerolite is a very well-known brand, when it comes to both hand luggage and hold luggage. 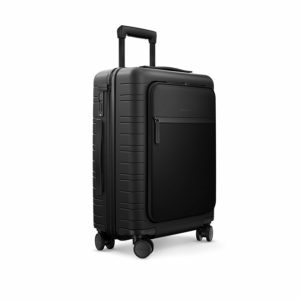 They have spent years building a reputation as one of the leading brands in luggage production, so we were definitely expecting good results from this smart suitcase and we were certainly not disappointed. Very easy to move around. We had already heard a lot of good things about this brand, so we were definitely expecting good things from this smart suitcase. Starting off with the design, we were instantly impressed by the durability of the hard shell case. Luggage like this tends to get bashed around quite a lot, so having such a robust shell is great. You can certainly tell that the material is of a high quality and that the suitcase has had a lot of thought put into the design. 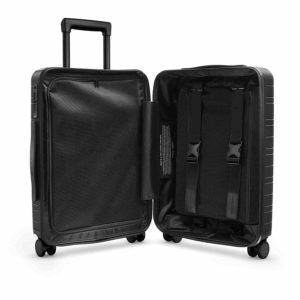 One thing that we really liked about this one is the fact that it is a spinner suitcase. This makes moving it around so much easier; even more so given that it has a retractable handle as well. The handle itself is very comfortable to use and the rubber grip makes things a lot easier when you are in a rush. The USB charging port on this suitcase is easily accessible and we had no trouble plugging in a smartphone to charge it up. Charging didn’t take very long at all and we were really impressed with how much power it gave the phone. Although this particular suitcase is a little more on the expensive side, you definitely get what you pay for and it is worth the extra money, especially given that it is approved by most major airlines. This is another very popular brand, when it comes to smart luggage, so we knew that we were going to get good results but we weren’t expecting to be quite so impressed. This is why we have chosen this particular luggage as our top choice today. To say that we were impressed by this smart luggage is an understatement. It is fantastic. First of all, it has an absolutely solid hard shell outer casing that feels incredibly durable. The outer material itself is of an incredibly high quality and this is obvious when you feel around the suitcase. What we really liked about this one is the USB and lightning charger that comes with this suitcase. The charging port itself is easily accessible and it is highly effective. Another thing that we really liked is the sheer amount of space that you get in the inner suitcase. There is easily enough space in there for hand luggage and more. Moving the suitcase around was no problem at all thanks to the spinner wheels which make turning around corners and awkward spaces easy. Although you can expect to pay a little more for this suitcase, you are definitely getting your money’s worth and this is why we have chosen this one for our top spot today. Hopefully after reading our reviews you now have a much better idea of the best smart suitcase for you. Can i get one of the bags delivered to Brisbane, Australia please.